Dr Samuel Epstien, Author of The Safe Shoppers Bible states that he believes that Personal Care Products are potentially more harmful that smoking - Why Would He Say This?? From the day a baby is born he/she is having products put directly onto their perfect new body. But what about the SLS (used as an engine degreasant), the Propylene Glygol(used in breakfluid) and thousands of other industrial chemicals that are in the majority of products sold in the highstreet? Dr Epstien states that a build up of these chemicals from the day we are born, can be potentially disasterous for our health. Here at New Ways Of Living we have taken this on board and are happy to present you with healthy alternatives. These products only have the mildest of ingredients that will not build up a toxic overload over time. We hope you enjoy using them with you precious new child. Here is a range of five products created especially for babies and children, the products are fun to use, whilst knowing that they are free from any potentially harmful ingredients. 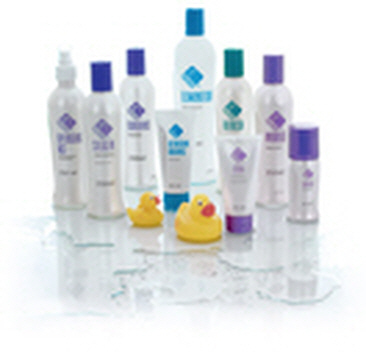 Like all Neways Products they have a seal of safety from the Prevention of Cancer Coalition. This hair and body wash is very mild and safe for kids to be using all the time. Children love to squirt it and rubb it into their bodies. Use in place of soap. Apply foam to head and body and cleanse as needed. It's not a good idea to inhale strong chemicals from sprays. The New Generations spray is very mild, yet hightly effective. Never have your child moan at you for combing their hair again, whilst leaving hair with a healthy shine and natural softness. Add to damp or dry hair and comb through. This rich and creamy lotion is soothing and gently moisturises protects your child skin. It contains aloe vera, standardized oat extract, olive oil derivative, vitamin E, Rose Hips Oil, and Shea Butter. Apply a desired amount to clean skin and rub in. Alone or used with essential oil blends, NEWays Generations·Baby Lotion is an ideal preservative-free lotion for massage. Talc is a soft grey-green mineral used in some personal hygiene and cosmetic products. Inhaling talc may be harmful as this substance is recognised as a potential carcinogen. New Generations Talc is made from ingredients that will not aggrivate an adult or childs system. There is a lot of research connecting talc to disease, so here you have an effective replacement for all the family. Cleanse nappy area and let dry. Carefully shake powder into nappy or apply to the nappy area and close to the skin. Keep away from child's face. This velvety powder absorbs moisture leaving your child's skin feeling silky and smooth. Based on all-natural tapioca, our baby powder is talc-free for your child's safety. It also includes aloe and nourishing vitamin E to naturally soften skin. This bubble bath is free from SLS and is the perfect formula to have in your bathroom. As already described in the adult formulas, you want to be careful what ingredients make the bubbles in your home. Bath time is not the same without an endless supply of thick, foamy bubbles. Add two to three capfuls to bathwater when filling. fragrance-free formula is great for a baby delicate skin. ‘Children need mild ingredients to keep them safe! !